Dr. R.C. Sproul brought the conference to a close with a message entitled Can We Enjoy Heaven Knowing of Loved Ones in Hell? To address this topic, Dr. Sproul read from Revelation 21:1-8 and also from Romans 8:19-30. They called it “the shot heard around the world.” It kicked off an 8-year war of independence for the United States of America. But an event took place prior to that in the city of Boston: The Boston Massacre. This event touched Ethan Allen in Vermont, Patrick Henry, George Washington, Sam Adams, and John Adams. In the Boston Massacre, British troops fired upon unarmed civilians. Do you know how many civilians were killed in the Boston Massacre? Just five. Nothing compared to the destruction of Canaanites. Every time we come together to worship we have a taste of heaven. But what came to the Canaanites (or to the world in the days of Noah) was a taste of hell. The final consummation of the reign of God over his creation must and will certainly involve separation. There will be an antithesis between those who are faithful and receive their inheritance in the family of God and partake of the inestimable joy of heaven. And there will be those outside the camp who are consigned to the lake of fire. Streets of gold on the one hand, fire and brimstone on the other. Any attempt to water this down exposes ourselves to the curse of God. So: How Can We Be Happy in Heaven if Our Loved Ones Are in That Lake? In verse 4 we read, “He will wipe away every tear from their eyes, and death shall be no more, neither shall there be mourning, nor crying, nor pain anymore, for the former things have passed away.” Heaven is a place where God personally wipes away our tears. And when He wipes them away, they never return. Expelled are death, disease, pain and sorrow. For all who dwell in heaven will drink freely from the water of life. Event #1: We had been in chapel at the seminary (a very liberal seminary). Sproul listened reluctantly to a sermon that disrespected and dishonored everything that is precious to those who love the Reformed faith. Sproul walked out of chapel with Dr. Gerstner and they were walking to the parking lot. Dr. Gerstner walked in large strides. 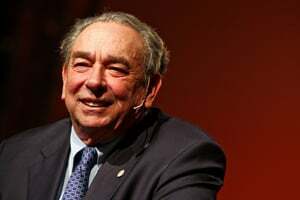 And Sproul said to Dr. Gerstner, “If Calvin had heard that sermon, he would have rolled over in his grave.” And Gerstner corrected Sproul in mid-sentence to inform him that Calvin has entered eternal felicity which could not by any means be disturbed. Event #2: One student asked Dr. Gerstner, “How can I be happy in heaven if I’m aware that one of my loved ones is in hell?” Dr. Gerstner responded: “Don’t you know that when you are in heaven you will be so sanctified that you could look at your own mother in hell and rejoice in the display of the justice of God.” And Sproul burst out laughing, informing Dr. Gerstner that his statement was absolutely ridiculous. The latter verses comprise the golden chain, the order of salvation. We often read these verses and debate predestination, forgetting to discuss the end or the goal of predestination. The purpose of predestination is that we be conformed to the image of Christ. We are elected in Christ, for Christ, to be brought into conformity to Christ. At these Ligonier conferences, we often focus on the doctrine of justification. It is the article by which we stand or fall. But the end of the chain is not predestination, or justification, or effectual calling. What is it? Glorification. When is the last time you heard a sermon on glorification. There are three reasons why we worry about our future happiness in heaven when we discover that our friends or family and possibly even our own spouse is not there. 1. We don’t know who God is. We are so baffled by God’s holiness that more often than not we are offended by it. 2. We don’t know who we are. We say “to err is human” and thus minimize our sins and unholiness. 3. We don’t know what glorification entails. Yes, we will get new bodies and not need glasses, hearing aids, or numerous medications. But do we meditate on the fact that there will be no need for light, because the Lamb of God will illumine everything. But that which will be most conspicuously absent in that place is sin. There won’t just be a new heavens and earth, our sanctification will reach its destination. Glorification is not exaltation. It is the perfection of our sanctification. Dr. Sproul explained that he used to do a demonstration in seminary. I’d select one student to play Jesus. Another person to represent Hitler. And a third student represents the Apostle Paul. [Dr. Sproul believes that Paul was, apart from Jesus, the most holy man to have ever walked the earth.] So on this continuum between Hitler and Jesus, where do we put the Apostle Paul. He is close to Hitler. There is a chasm between both Hitler and Paul (on the one hand) and Jesus (on the other). The chasm is so immense that the separation between Hitler and Paul is negligible. Until our glorification, our concerns and our sympathies rest more with wicked human beings. But not so after our glorification. Then, we will share a greater resemblance with Jesus, and thus there will be a chasm between us (together with Jesus) and unredeemed humanity. When we are glorified, our passion will be for the vindication of God’s name. Because we are so Hitler-esque, we can relate to monstrous sinners more than we can relate to Jesus Christ. That’s why we find the doctrine of hell so repugnant. That’s why we feel sorry for Uzzah when he’s killed for touching the ark (2 Sam. 6), or Aaron’s sons who were struck down for playing at worship (Lev. 10). We don’t feel as sad for the slight Uzzah and Aaron’s sons imparted to the glory of God. But the day will come when our passion and our identification with the glory of God will be so great that our sympathies will be with God and not with our fellow creatures who belittle God’s glory. We are not there now. But in our glorification we shall be.